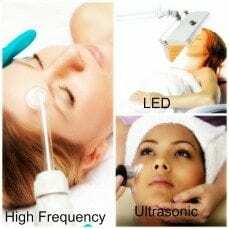 Ultrasonic – Ultrasonic waves are used to stimulate blood flow and promote lymphatic drainage to nourish the skin and gives it a youthful rosy glow. It helps penetrate products customized for specific skin conditions. It also promotes collagen. An organic mask or specialty serum will be chosen to address your specific skin concerns. LED Light – LED bathes the skin in red and infrared light, stimulating the deeper skin tissue, leading to the reduction of periorbital wrinkles. Clinically proven to help reduce the visible signs of aging. Visible signs of aging are the appearance of fine lines and wrinkles around the eye and lip area and sundamaged skin. It stimulates the natural anti-aging process. Improves skin tone and clarity. Detox Gel – This is a custom gel that is often applied after a HydraFacial or microdermabrasion to help speed the clearance of blackheads, whiteheads and pimples. Enzyme Exfoliation – An enzyme exfoliation added after a HydraFacial or microdermabrasion will create additional post-treatment exfoliation. This will help improve tone and texture and stimulate collagen. Microcurrent Eye Treatment – An instant eye opener, using a low level microcurrent that lifts the brow, opens the eye and drains under eye puffiness. High Frequency – This is included, when needed, at no additional cost. High frequency increases blood circulation, eliminates toxins and acne bacteria, decreases redness and inflamation, and helps in lymphatic drainage. It assists in oxygenating the skin. Most acne treatments will include high frequency. Hand Smoother – Hands are another area that show signs of aging. Choose either a exfoliating scrub and moisturizing massage, or a layer of chemical exfoliation to smooth rough hands.